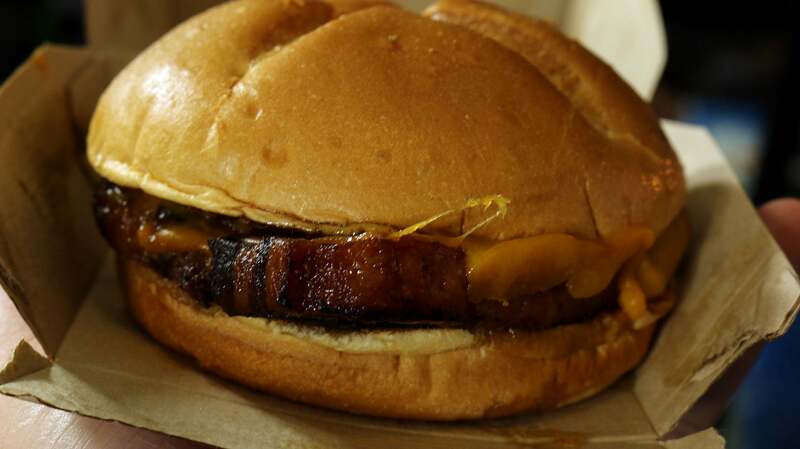 There is a place that is both before and beyond bacon, and Arby's dares take us there, at least for a limited time. Whatever other plans Snacktaku had this week died at the feet of Arby's Smokehouse Pork Belly sandwich. Whenever I hear someone waxing poetic about the salt and sanctity of the holy bacon, I hear the voice of a long-dead Jedi in the back of my head: "There is another." 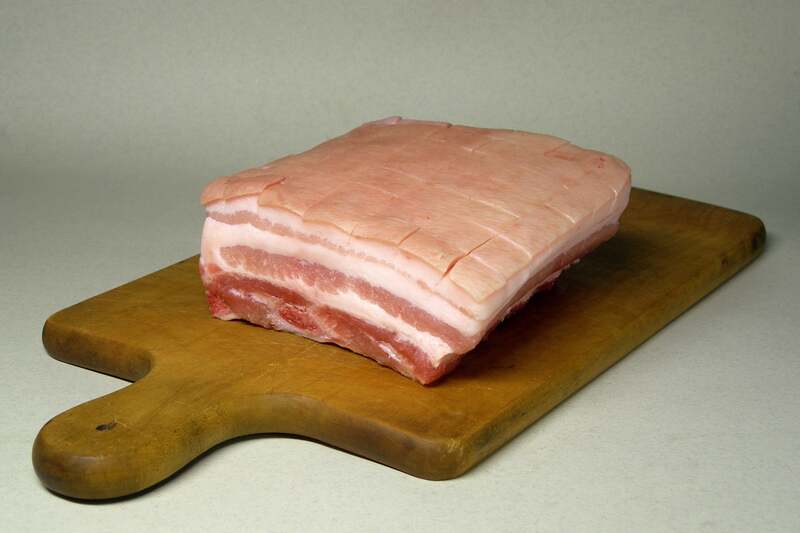 Pork belly is the origin of bacon, a fatty piece of pig that, when properly prepared, is much better than the fried parts of its sum. Why slice into thin, crispy strips that which can be devoured whole? People in Korea, China and Japan make glorious food out of pork belly. The Italians make pancetta from it. In Germany it's a primary component of schlachtplatte, which also might be a Klingon mating ritual. And at Arby's, for a limited time, it is smoked for many hours before being slapped on a bun with cheese, mayonnaise, fried onions and barbecue sauce. Behold the Smokehouse Pork Belly sandwich. It looks much better in promotional materials, but they don't impart the slab-like shape of the meat that's tucked between those buns. Alternating lines of smoky meat and fat, wild and free yet geometrically contained at the same time. There is order here. As I learned during a trip to Arby's headquarters in Atlanta shortly after my Smokehouse Brisket review several years back, the mayonnaise here is a necessary evil, countering the dryness of the bun, adding essential moistness. It still looks pretty hideous. 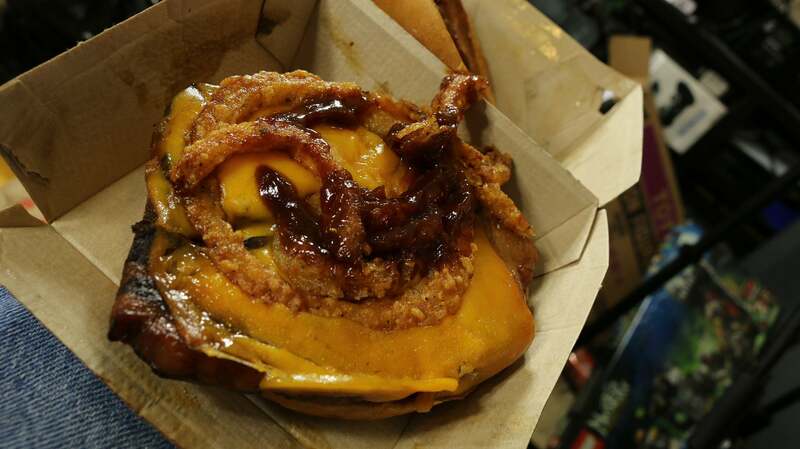 On the top side of the meat we have cheese, which seems to be only there to hold the meat in place, along with crispy onions (it's a thing with Arby's) and barbecue sauce. The pork belly may be largely hidden from the eye, but there is no escape for the mouth. Pork fat might not be the most conceptually appealing edible animal part, but it holds flavour like a sonofasow. The gelatinous mass melts away in the mouth, leaving the strips of actual meat to challenge the teeth. I like it! Be sure to watch the video up top to see how much. 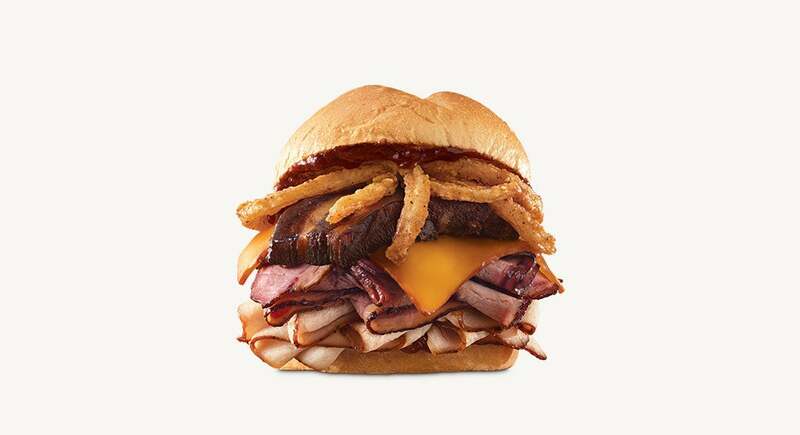 Arby's Smokehouse Pork Belly sandwich is a guilty pleasure. 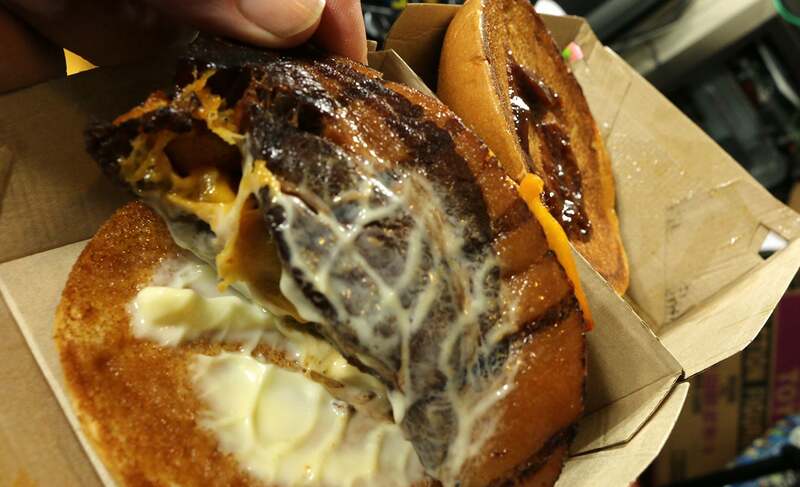 One of the guiltiest, really, each weighing in at some 860 calories, 550 which are from fat. Thankfully the U.S.'s second-largest fast food chain is a merciful one, making the delicious beast only available for a limited time. Oh, and they have also got this. Brisket, turkey and pork belly. Do not ask me to eat that, as it is not going to happen. Then there's that bit of plastic-like American processed cheese again that has an unEarthly hue to it. That pork also deserves a better delivery platform, not within those confines. I wish I was as witty as Jon Stewart to insert an Arby's joke (here). Imagine if the Australian version of the website featured fast food products that were available in Australia!